1934 The WCTU met Feb. 20th with Mrs Rev. Wilkinson Devotionals were conducted by Mrs C.S. George who used as her Scripture lesson Psalm 108 - 7 verses. Mrs Mitchell led in the singing of two songs. In the absence of the Secretary Mrs. W.J. Stewart acted as Sec. Pro. Tem. Attention was called to the "New Member" campaign. Miss Butler presented plans for a bazaar to be held in Y.W.C.A. Building in Des Moines Apr 20th. Unions were asked to donate articles for sale at this bazaar. Motion by Mrs George, seconded by Mrs Robb Lincoln that Society hold Market Day April 14th. Motion carried. Miss Bailey was instructed to secure suitable place for holding same. Motion made by Mrs George seconded by Mrs Hess that Pres. appoint committee to visit schools and place W.C.T.U. blotters in same. Motion carried and following committee was appointed: Mrs Knowles, Mrs Geo Lincoln, Mrs Mitchell, Miss Sherman, Mrs Gregson and Miss Butler. Miss Bailey read an article from magazine "Time" relative to liquor advertisements. Motion made by Miss Bailey seconded by Mrs Watson that W.C.T.U. send to the Radio Commission a letter of appreciation for its action in cutting out liquor advertising. Motion carried and Miss Bailey instructed to send letter. Treasurer reported no funds in Treasury. Motion by Mrs George seconded by Mrs Gregson that offering be taken at each meeting. Motion carried. 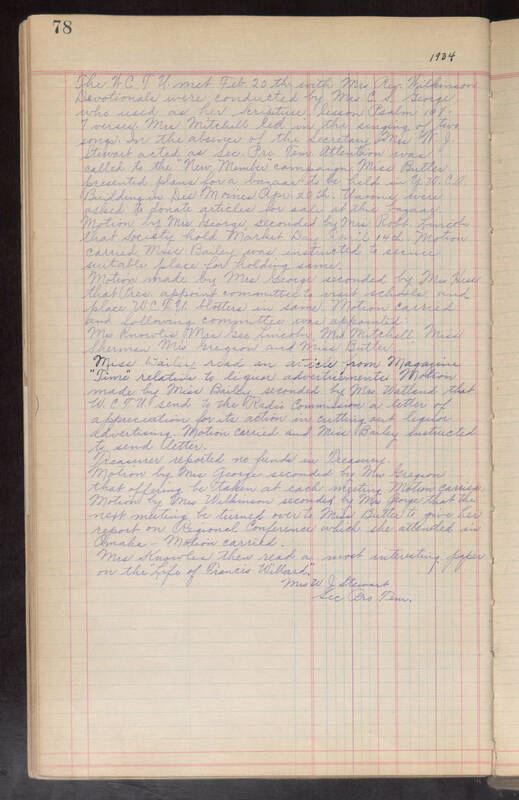 Motion by Mrs Wilkinson seconded by Mrs George that the next meeting be turned over to Miss Butler to give her report on Regional Conference which she attended in Omaha - Motion carried. Mrs Knowles then read a most interesting paper on the "Life of Francis Willard." Mrs. W J Stewart Sec Pro Tem.